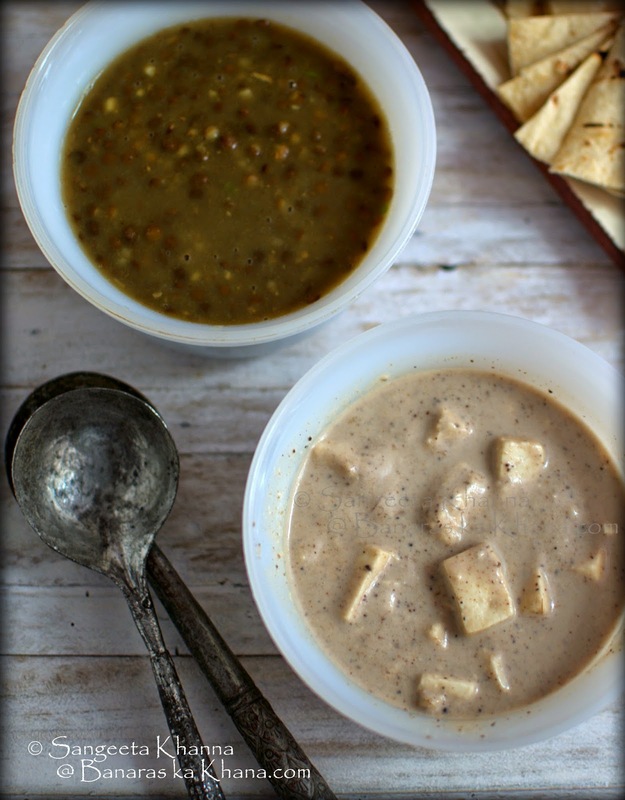 Paneer safeda is made in many versions using different types of nuts for their subtle flavors and the taste differs in each of those versions. This recipe is a simple and quick one, like all my recipes which is good for everyday cooking and the flavors are so exotic that it is fit for a formal dinner as a main course dish. Actually last time when I made this dish for a large family get together of 20 people I choose this dish because a few extended family members did not eat garlic and onion. And I had to cook a no fuss recipe because there were many more dishes to be taken care of for a 7 course meal for 20. No need to tell that this dish became the talking point at the table. Simple delicate flavours and rich tasting curry. Many of them asked for the recipe and when I told how simple it is, they were surprised. This paneer safeda is a Jain recipe (without onion and garlic) but a few other versions make use of onions and a bit of garlic too. Some call it Doodhiya paneer or Chandni paneer with minimal variations like using chopped almonds and saffron as a garnish or finely chopped green chillies and minced ginger as a garnish. We prefer paneer safeda in it's pure white form. Just like this one. As I mentioned, paneer safeda is a special recipe meant for formal dinners, more because it is a bit rich tasting due to the use of nut paste. Also because it presents delicately flavored aroma of spices that is appreciated well in most Banaras homes. 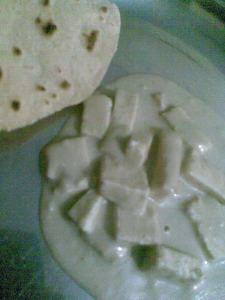 And paneer safeda goes well with butter naan or roomali roti, more reason to be erved for such north Indian meals. all these ingredients are to be made into a paste with some water in a spice grinder . Cube the paneer into rectangular pieces and keep aside. Make a fine paste of cashews with some water and keep aside. Cashews can be soaked for a few hours for making fine paste but do it instantly most of the times. You just have to run the grinder for a few more minutes if you are grinding dry cashews along with the spices. 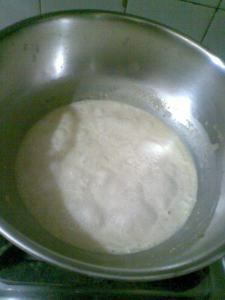 Now pour the fresh cream into the pan (I used a steel kadhai) and filter the masala paste right into the kadhai. Place a sieve on top of the kadhai and pour the masala paste into it and let all the masala extract pour into the kadhai. Reserve the masala solids to flavor some daal etc., I usually make some sabut masoor daal too with this curry and the same masala gets used in the daal. Sometimes I add the masala solids to kali daal or chane ki daal. 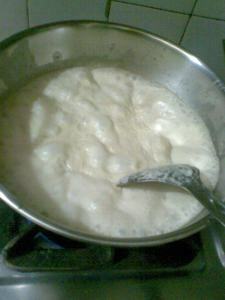 Coming back to the white gravy, now keep the kadhai on flame and let the mixture come to a soft boil. 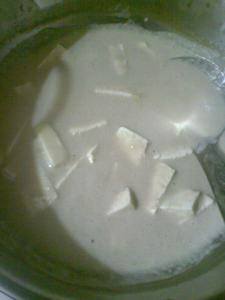 Now add salt and the paneer pieces and let it simmer again, just for 2 minutes more. Cover the kadhai, put off the flame and let it rest for 5 minutes so that the flavors get seeped in.. Serve hot with any kind of flat bread....we did not have any side dish this time as it was meant to be a light but special dinner It truly was so. You would agree when you try this paneer safeda at home. 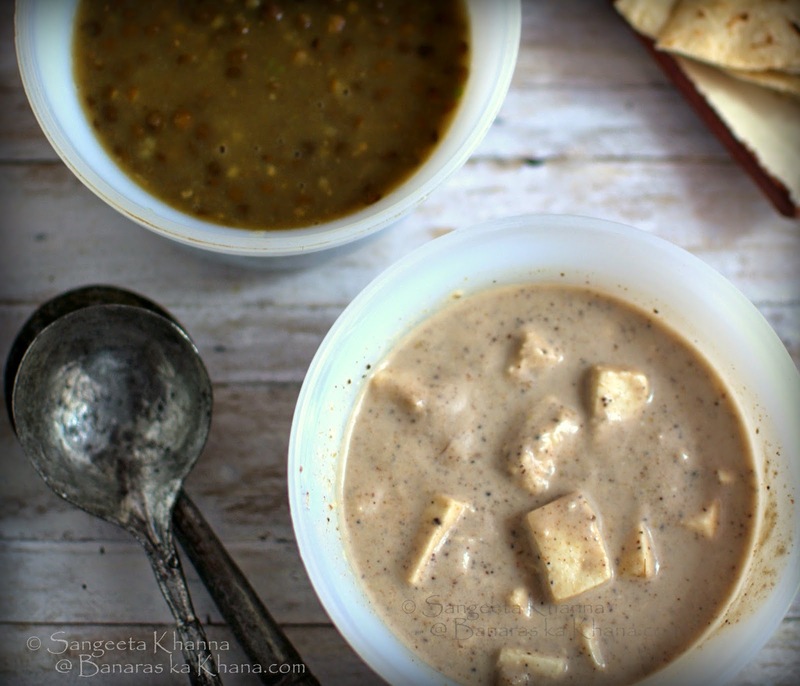 Enjoy the curry that is often called Chandni subzi or Chandni paneer, doodhiya paneer. Most common name known in Banaras is paneer safeda. If you don't filter the masala paste for this curry its not a problem. Only that the curry will not be as white and smooth as the picture above. I cooked paneer safeda again sometime back for a dinner and there was quite a lot of leftover curry. This time I did not filter the masala paste and the curry was a bit grainy and a little darker as seen in the picture below. But that taste was unmistakably the same. Incidentally I cooked sabut masoor ki daal too even though there was no masala solids after filtration. Some foods become such an inseparable pairing in families that they keep repeating together always. I hope you would like paneer safeda the way we do. Try it and let me know. I'm a big time paneer fan :) Though I've heard of many paneer recipes ....the safeda seems new to me and is an interesting recipe, I'll book mark it for now, and def. give it a try sometime. Thanks. thanks Suparna...i am sure it'll become a favorite at your place....this is a fuss free n fantastic recipe..
wow..this looks so nice dear..like our kerala stew..mild yet spicy from pepper..cool one.. 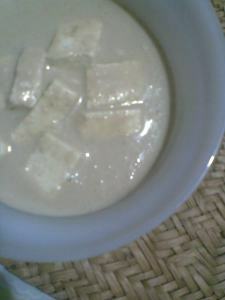 So glad you liked this paneer safeda recipe. Thanks for letting me know.